Chocolate Peanut Butter Cookie Cupcakes!! Well Hello!! Its been awhile since I have been on here. Well it has been quite a year. We welcomed our baby boy into the world a year ago and now that life is getting somewhat back to normal-ish (I mean we get real sleep) I thought I would throw around a few posts. My good friend Sara at Golden Poppy Press came into town for a visit. I was telling her about these cupcakes I occasionally make and she said I had to post directions so here ya go! They look impressive and taste amazing. They are super simple and a good activity with kids (kids older than mine that's for sure). I took these to some co-workers so I wouldn't eat them all and I had people who aren't chocolate fans raving about them. So here ya go! The basic idea is make cookie dough and make cake batter and put both in cupcake liners. Feel free to mix and match flavors. I have done chocolate chip and its amazing too. You need a package of peanut butter cookie mix and chocolate cake mix. Follow the package directions for each. So make sure you have eggs and oil on hand. I pour my cake batter into a spouted measuring cup so that it makes less mess when I pour it into the cupcake liners. Drop pieces of peanut butter cookie dough in so that they are on top of the batter. You don't want them touching the bottom. Cover the cookie dough with the rest of the batter. The peanut butter cookie ends up being a nice surprise. They don't look peanut buttery at first! Let your cupcakes cool completely. This makes 24 cupcakes and some cookie dough is leftover for some cookies! They look like an ordinary chocolate cupcake! Now on to the frosting. I was a bit brain dead this day and doubled my frosting recipe because I wanted two kinds of frosting. Not sure what I was thinking. I had a TON leftover. So one stick of butter should do you. But you also need cocoa, peanut butter (creamy kind), milk, vanilla, and powdered sugar. Add 1 tsp of vanilla, about 1-2 tablespoons of milk, and 1-2 cups of powdered sugar. I just sort of eyeball the consistency of the frosting. If it is took runny I had more sugar, too dry add more milk. Whip until fluffy then take half of your vanilla buttercream and put it to the side. Add about a 1/4 cup (or a couple good scoops) of peanut butter and whip throughly. You may need to add more sugar if the consistency gets too soft. Ta Da! Peanut butter frosting!! Yummmmm! Now add cocoa to the other half of the vanilla buttercream. I did a 1/4 cup here and I think it was too much. Next time I think I will do a tablespoon at a time until I get the right flavor. Darn I am going to have to taste test more as I go! I put mine into some nifty piping things I had but they were kind of a pain. I had to keep refilling. Next time I will use something different to pipe. They do look nice though. I put the peanut butter frosting layer first and then decorated with chocolate. What to do with all that summer basil?? Back in August I made a post to Facebook that I was harvesting some of my summer basil. A friend from high school asked how I was doing that which gave me the idea that maybe I should document this as others maybe interested. As previously mentioned we just moved to a new house. The house was built on land that was formerly farm land so the soil is good and we are always finding weird things growing in our yard! So what to do with the basil? Well I decided to freeze a bunch of it and also make some yummy basil oil! Once you pick the good leaves out put them in a sink of water to wash off all the dirt and bugs. Here are the reject stems and leaves ready for composting! Back into a sink of clean water for a second wash to get any dirt that was missed the first time. Next I put them in my salad spinner in batches to get all the water off of them. They are going to added to oil so the leaves need to be as dry as possible. Push it through and try to get out as much oil as possible. The basil pulp is what will be frozen. Be sure to strain the oil a second time to get out more pulp. The pulp goes into a silicone muffin holders or ice cube trays then into the freezer for a few hours. Once solid they get wrapped individually in plastic wrap and put in the freezer for future use. Let the oil sit and settle and skim oil off the top. This is amazing over fresh tomatoes and mozzarella. Use within a week or two. Hello blog world! It's been awhile since I've posted. A lot has happened since the Goofy Challenge in January. We had a house built, moved in with in-laws, moved into the new house, and are now expecting our first kid in November! So there hasn't been a lot of competition to write about. We did decide to do one of our favorite 5k races the Fort McHenry Tunnel Run. This run sponsored by the State Police benefits the Special Olympics. This was also a training even for the State Police recruits. They run as a unit doing those military style chants. Originally I wanted to try and stay ahead of them because I remember from the previous time we ran it that they start at the very back but yea they were much faster than I remember. They are still fun to see even if they are passing you by! 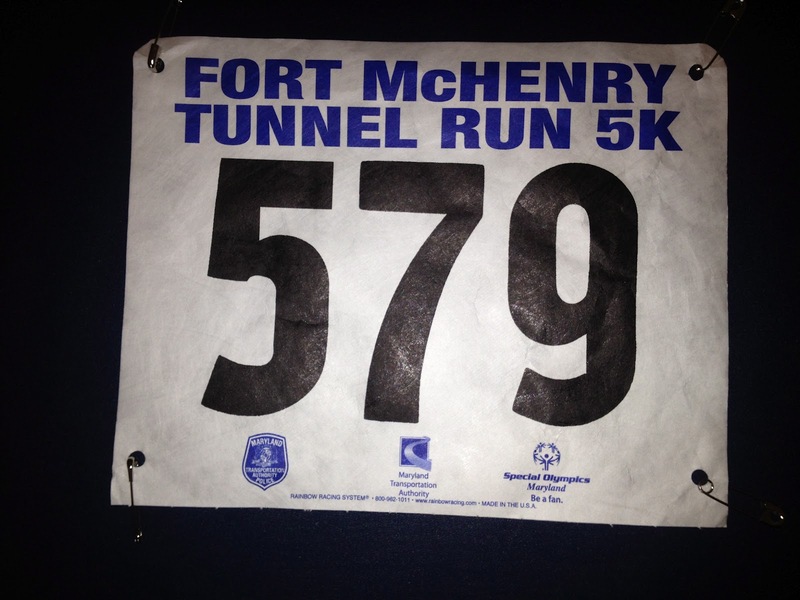 Being 7 months pregnant my plan was to walk the 5k and try to be under an hour. Being a competitive person I couldn't "just walk it." I learned that even though I felt like I was power walking well I was getting passed and I was passed by another pregnant chick....so I decided I had to run - a little. In the tunnel were signs to read and pictures every few hundred feet so I made a plan. I would run sign to sign then walk to the next sign then run as long as I could see the next sign. If I couldn't see the next sign then I would continue with the walking. It worked well and I felt like I was moving. Never done a 5k before? No problem there were clearly a lot of families and non-runners here that were just interested in a good walk to support a good cause. There were strollers even though I thought I saw a sign that said no strollers, maybe that's my baby brain. Either way that means we can come back next year with the little man. Maybe this will be his first 5k! Pregnant and not sure what that means for running, well me neither but The Running Mom knows much more so check her out! I took my own water filled up the bottle at the half way turn around then again at the end. I went through a lot of water! The tunnel actually gets pretty warm in there even though they pump fresh air in. At the end they had bagels, fruit, and Outback chicken sandwiches! That sandwich really hit the spot. WARNING! This is long but there are lots of pictures!! Well we survived! I am sure many doubted we would be able to finish but we did it! A half marathon and then less than 24 hours later a full marathon and in Disney World no less. Shirts for the events. Really Nice! We arrived in Disney World on Thursday evening and checked in to the Port Orleans Riverside. On Friday morning we got up around 8am to have a quick breakfast and then head over to the Wide World of Sports Complex for packet pick up. There are several running events going on this Marathon Weekend. They had a 5k on Friday morning that went around the worlds of Epcot. The half marathon would be Saturday morning and the full marathon Sunday morning. They also added a relay option to the full marathon. There were also some kids races too. We signed up for the Goofy Challenge that consisted of the half and full marathons. We picked up our bib numbers in the first building, while doing so they would cheer anytime there was someone who was Perfectly Goofy meaning they have done the Goofy race each year it has been offered for the past 7 years. We then went straight into the store in this building to get ourselves some jackets. In 2010 we did the marathon and the only jacket sizes left were XL. This time we were determined to make sure we got ourselves a jacket and wouldn’t you know only XL was left! Ack! We then made our way to the next building, which had the expo and shirt pick up. We got the shirts for the half, full, and Goofy. This area had a larger store, we actually went there before getting our race shirts, as we didn’t want to miss out on jackets and other cool stuff. We both ended up getting ourselves marathon jackets and I got a Goofy one too. They didn’t have a Goofy jacket in the hubby’s size; again it was all XLs and XXLs. We also picked up a couple other fun mementoes and ran into a hometown friend who was here on vacation and decided to do the half marathon while she was here. After picking up our shirts we toured the expo and all of the fun stuff they had. Touring the expo always gets me energized and ready for the race. We headed back to the room to drop off our new swag and headed to Downtown Disney for lunch. We walked around a bit and had lunch at a fun Irish bar. We relaxed back in our room and prepared for dinner at the Yachtsman Steakhouse in the Yacht Club Resort which is attached to the Beach Club Resort, our favorite. Dinner was tasty and relaxing. We headed back to the room to go to bed early as a 3am wake-up isn’t fun. 3am rolled around quickly. We got up and quickly got ready to head out. Disney had event buses from the resorts and they suggested you be on the buses by 4am to insure you are at the start on time. We decided to aim for 3.30am and we had no issue getting there. 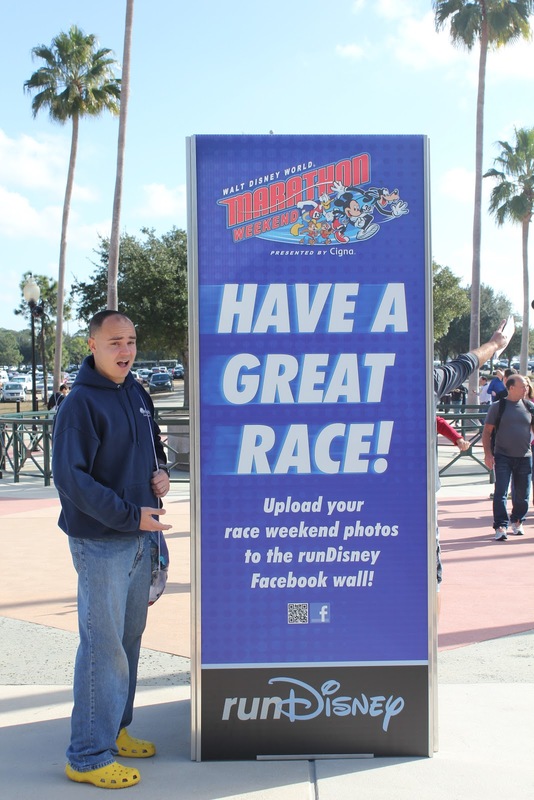 According to the runDisney Facebook page apparently some people had some trouble getting there on time due to traffic. Once we got to the waiting area of Epcot we checked our bag and waited. They had a DJ and the P90X guy took everyone through some warm ups. The weather was comfortable, a little on the cool side but a temp that would be perfect once we start running. Eventually they herded everyone to the start area with lots of cheers for the wheelchair racers as they headed there first. It is a good ½ to ¾ of a mile walk to the starting areas and you go by a tram graveyard area with very clearly not-in-use vehicles. It was kind of creepy. We got into our corral F. The nice part is each corral gets their own start with fireworks and everything! Donald Duck started each wave. The half was very very crowded! Many times I had to run on the grass to go around people and I am by no means a fast runner. There were LOTS of walkers. I am a big proponent of walking but the course became very narrow and walkers weren’t staying to the right. Definitely way too many people for as narrow as the course gets. We stopped several times to get pictures with characters. 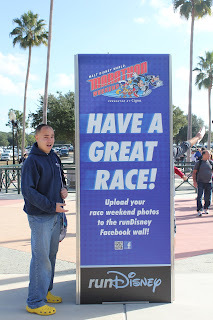 runDisney’s motto is “every mile is magic” and they do a nice job of trying to distract you from running every mile. There is lots to see whether it is characters, marching bands, dancers, pictures in front of the castle, It makes for a fun time. About ¼ mile from the finish you run by a fabulous gospel choir and that gives you the energy you need to make it to the finish. After getting our medals we bypassed the food line and made our way back to the resort as we had an early dinner planned. In true swimmer fashion I brought my kickboard and fins to kick around in the pool to try and keeps the legs loose. After we showered and stretched we head to Downtown Disney where we had early dinner, 3pm, reservations at Portebello’s. We had some tasty risotto balls and I got some pasta, shocker I know. After “linner” we walked around a bit and then got a tasty treat from Ghirardelli’s before heading back to the room to relax and turn in early again. 3am reared its ugly head again and was much harder the second time around. We used the same plan as yesterday. We started walking to the bus when I realized I forgot my bib! That would have been horrible! Luckily I realized it and we didn’t lose any time. The time before the race started seemed to go by much faster today. Before we knew it we were starting on our 26.2 mile journey. This time Mickey Mouse started the race. The first 13.1 felt great. We were on target to make our goal time and were 10 minutes faster than the previous day. Unfortunately shortly after hitting the half way point things started to fall apart. We are in Florida and well unlike the last time we ran the marathon here it was warm! Luckily they have rest stops every 1.5 miles or so and I chugged down the Powerade every chance I got. The first half of the course is pretty nice. You start near Epcot, run to Epcot and around and then at mile 4 you are back at the starting area, so you really haven’t made much progress but then you start heading towards Magic Kingdom. Before getting into the actual park you go through the Transportation Authority which in both races tricked me into thinking we were entering the park except we still had about 2-3 miles to get there. After going through here we start running towards the Contemporary Resort which is a neat looking building, the monorail goes through the building! When you do enter Magic Kingdom it is awesome!! You enter on the side by the Christmas tree and then straight down Main Street USA towards the castle. Right before the castle you go right into Tomorrowland and around the back side of the castle and then running through towards the front, that’s amazing too. Next a right into Liberty area and out a side gate to start the long, long trek to Animal Kingdom. Shortly after Magic Kingdom is when you hit that half way mark. At this point you have the high from the Magic Kingdom and all the cheering but the crowds are gone and you are pounding the pavement in some very remote back areas. They give you some entertainment every mile but its still hot and if you aren’t stopping that entertainment only lasts you a couple minutes and there isn’t much shade either. On the long stretch to Animal Kingdom to you get to go by such beautiful Disney sights as the waste water treatment plant and the compost piles. Yup you go much faster trying to get through those areas. Kudos to the volunteers at the water stop by the compost piles. Thanks for being there for hours! Eventually you get to Animal Kingdom and it seems like forever to get there and its over so fast. As you enter the back areas they had fun animals like goats, sheep, and screech owls whom you could stop to take pictures with. After quickly going through Animal Kingdom you are back to main roads headed towards Hollywood Studios. Luckily once you hit Hollywood Studios it is action packed til the finish. Getting there was much harder than I remembered. I was hot, tired, and sweating less. This was not as enjoyable as last time. I had to take a walk break that wasn’t associated with a water stop. I felt so guilty that I was letting the hubby down but I was so freakin tired. After a few minutes I had enough energy to run to the next water station. We eventually made it to Hollywood Studios and we knew the end was getting closer. You enter on the opposite side of the Tower of Terror (the best ride ever!) and see that the whole front of the building is fake and its open behind it, way cool. There is also a candy stop right away. Jeff had a Krackel…again. I had some fruit snacks and boy did they taste amazing at this point. We ran by the animation studios and through where they were making costumes and around the back of the park by the Backlot tour then up through the city with a left by the SciFi restaurant and American Idol experience to the main center isle of the park where there were tons of people watching. At this point the park is open to the public which poses interesting challenges for Disney cast members as guests need to get from one side of the park to the other across the race course. They used a jumprope to divert runners to one side or another around an island that gets guests halfway across. As usual Disney has thought of everything. As we exit Hollywood Studios we are greeted with cheers outside the park as we head to our final park. We run along canal by the resorts where there is a DJ playing Justin Beiber on a constant loop. He said it would make us run faster to get away! We ran in front of our favorite resorts on the way to Epcot. We entered near the beginning of the worlds and ran around all of the worlds and back toward the entrance and the big ball where we again divert to the right and go past the gospel choir. We hi-fived Goofy just as we ran to the finish line. We were so incredibly happy to finish. We got our Mickey Marathon Medal and then headed directly to get our Goofy Medal. In those last 6 miles we just kept reminding ourselves of the good dinner at Citricos we would be having and the medals. We kept running for the medals and damn do they look good! On one of our bus rides we met a woman who has done all 19 Disney marathons and all 7 Goofy Challenges and this year did the 5k as well to keep the streak going. I am so impressed by her dedication to the series. She said each year there is an extra that the folks with a perfect streak get. She keeps going because she doesn’t want to be out of the perfect club. They don’t call it Goofy for nothing. Overall it was a tough tough challenge but I am glad to be able to say that I completed it. We didn’t make our marathon goal time but we were only off our 2010 marathon time by 5 minutes which is pretty good considering we ran a half marathon the day before. We wore Agent P shirts from Phineas and Ferb and got 17 shoutouts about our shirts! Some kids in Hollywood Studios loved the shirts! I am very proud of our accomplishment and it is something I never thought I would be able to accomplish, considering I actually don’t like running that much. Serge from Toy Story making everyone "Move! Move! Move!" Thank you Disney for providing the challenge but I won’t be doing it again. Thank you volunteers for being there for hours upon hours. Thank you cast members for providing entertainment for 26.2 miles. Thank you to my hubby for being my running buddy for the past 5 months as we got ready for this. Thanks to our friends and family for their support and well wishes. The Hardware! This run was all about getting the medals! Relaying is the way to go!